About Exercise Programs And Weight Loss... If you're interested in losing weight then you need to start thinking about weight loss programs. There are an abundance of options out there for you. You can join a local gym or fitness club; sign up with on online weight loss support group; start your own walking group; or do what I did, and begin your own at-home weight loss workout program. If working out at home interests you, then you may be interested in buying exercise dvds. 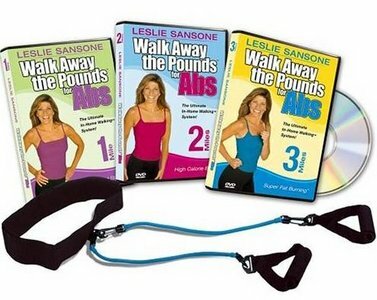 Home workout dvds are perfect for traveling, can be done regardless of the weather outside, and give you privacy-a biggie for me. Maybe you're thinking, I've purchased workout videos before and they didn't work. Well, truthfully, so had I. But I didn't really stick with the program, and that's the real reason I didn't get the results I wanted. The workouts I chose looked like fun; the lady on the cover was really fit; and so I figured what the heck. I wasn't really serious. Now I know that it's important to choose the right exercise program for my unique weight loss goals. When it comes to buying exercise videos for yourself, as a part of your weight loss program, there are several key factors you'll want to consider. This is important if you want to get the most results out of your workout program. First and foremost, you should consider the types of exercises you enjoy. If you don't enjoy it, you won't keep doing it. That's the bottom line. I've tried some dance aerobic videos that weren't for me. But, the power walking videos suit me just fine. I also know that I'm not particularly fond of Yoga workouts. I'd rather do Pilates instead. So if you know for sure that you enjoy aerobic videos, don't go and get Advanced Muscles Building. There are so many to choose from: Yoga, Pilates, kickboxing, and so forth. I like variety, as you already know, so I mix things up a bit and I have several workouts in my fitness library. Another thing to consider with exercise programs and weight loss is the intensity or level of difficulty of the program. Many videos like, P90X have several dvds and the workouts are done in phases, however the workouts are still intense. As a beginner, you may want to start with something less intense. Heed the recommendations listed on the workout program. Take not whether the program is suitable for beginners, and if so, will the program allow you to progress to an intermediate level, and then on to advanced. Or is the workout you're considering going to keep you at the beginner level. In which case your weight loss may plateau and you'll need to purchase an intermediate level program to make additional progress. What you do not want to do is choose an advanced level program like Insanity, and end up injuring yourself or quitting the program early because you can't keep up. Naturally, you have to consider the cost of your workout program. The prices will vary greatly, I can tell you that. From the 12.99 dvd to the 120.00 workout system. It depends on your budget, tastes, and how much support you from your workout program. Some of the more expensive workout dvds may be worth it if they offer multi levels of fitness training, provide nutrition guidance, menus, online support, and other tools that you would have to get separately anyway. Read exercise reviews online to see what others are saying about it before you take the plunge. These are just a few of the things you should consider when selecting exercise programs and weight loss. Take note, however, something is better than nothing. So if the choice is between a cheap workout and no workout at all- go for the cheap workout. You will still be doing the most important thing- getting active!